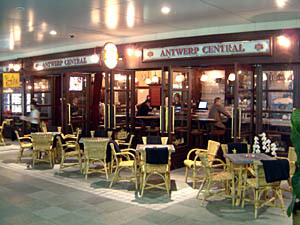 There are a lot of good Belgian beer bars in Tokyo, but Antwerp Central is far and away the biggest - a sprawling cafe/ bar/ restaurant with several dining spaces and a big outdoor terrace. The size, the lively atmosphere and the old-fashioned decor really give the place the feel of a European cafe. The staff are friendly and welcoming, and you can stay and linger over your drinks late into the night, a surprising feature in this office neighborhood. While the other Belgian spots in town successfully serve a niche market of adventurous beer afficiandos, Antwerp seems to be aimed squarely at the mainstream Japanese consumer out for an after-work drink. The beer list covers two dozen selections - enough to provide a cross-section of different styles, but not so many as to overwhelm to the Belgian novice. The limited selection also helps to ensure freshness. Four or five choices are on tap, the rest are in bottles. 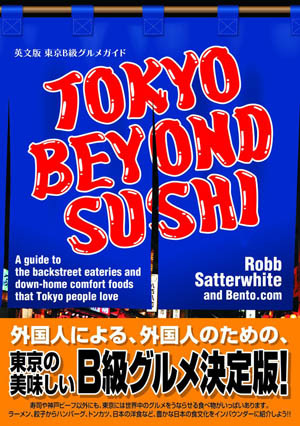 The list includes the occasional seasonal beer, as well as a few Tokyo exclusives. As is customary with Belgian beers each brand comes with its own special glass, and the waiters are well-skilled in pouring techniques. They're also happy to offer recommendations. One big surprise here, besides the 4am closing hour, is the high quality of the food. There's a daily specials board (always a welcome sign), and from it we enjoyed an excellent grilled venison - tender, very flavorful meat served with a fig sauce and a wine sauce. On the side was a beautiful assortment of roasted and grilled vegetables - well-cooked, pleasantly soft potatoes and garlic cloves, and grilled cauliflower and Brussels sprouts with just a hint of charcoal flavor. The equally delectable grilled lamb we ordered on a different occasion came with the same vegetables on the side, and we weren't at all disappointed to see them again. One traditional down-home dish is called "stoemp au larde" - mashed potatoes mixed with snippets of various root vegetables and served with a hefty hunk of braised pork. Of course the menu also includes Belgian standards like mussels (prepared in several different styles) and frites. The frites here come with a choice of novelty dips like the "samurai" (wasabi and mayonnaise), which is a fun touch, although in the end we prefer the more orthodox plain mayo, which is also available. Starters include simple but well-executed dishes like soft-shell crab and a very tasty avocado-crab salad. Preparation tends to be straightforward rather than elaborate, and portions are large. The main dinner menu stops at around 9:30pm, with a fairly big bar menu served till 3am. Y3000-5000 per person should cover ample food and beers. We've heard that a few more branches of Antwerp Central are in the works, with other corners of the Yamanote line already staked out. 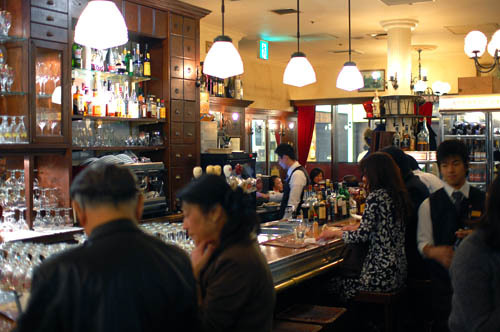 Perhaps Belgian beer is on the brink of reaching a mainstream Tokyo audience. If the food, drinks and atmosphere of the new branches are as good as they are here, we think that it's got an excellent chance. We'll certainly look forward to finding our favorite Belgian brews in a few more spots around town. Chiyoda-ku, Marunouchi 2-7-3, Tokyo Bldg Tokia B1F.